Under the section, the arrested Penans, aged between 12 and 60 years old, would be in police custody until a magistrate could hear their case. Belaga has no court and the Belaga district officer, who signed the remand order, is a Second Class Magistrate. Anyit slammed the police for arresting the two 12-year-olds whom he claimed were arrested for “taking pictures of the arrests”. He also said the police treated the Penans “like criminals” in what is a civil case. He also questioned why only eight of them were arrested when there were over a hundred people at the blockade. Anyit, who is in Sabah attending a native land conference, said he is uncertain if the eight were among those sought by police over an alleged intrusion into the dam site by armed Penans last month. However, he said he would challenge any fresh police application to hold the eight beyond Sunday. The eight Penans were arrested around 2.30pm on Thursday and brought to the Belaga police station to be locked up. 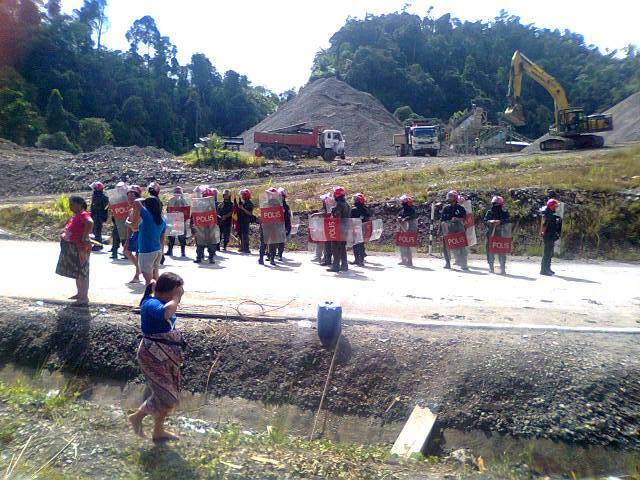 On October 1, state power company, Sarawak Energy Berhad (SEB), had lodged a police report claiming a group of Penans armed with parangs had intruded into the dam site and threatened workers at the powerhouse and the intake tunnel. SEB had to stop work for three days over fears for the safety of the workers. Zhao Jian Qiang, the general manager of the China Three Gorges Corporation – the Chinese company contracted to build the dam – described the intrusion as “serious”. Raymond Abin, an official with the non-governmental organisation, Save Sarawak’s Rivers Network, confirmed in a statement yesterday that “some 100 other Penans remained at the site to continue the blockade”. “Why arrest only eight of them, and not all, unless they are trying to intimidate these people,” Anyit asked. Abin claimed yesterday police also took down banners and dismantled wooden barriers on the road leading to the remote RM4.1 billion dam. Not to worry, Some BRAVE MINISTERS out there will order their release in no time. In Melikin, CRIMINALS and GANGSTERS were released on the order of these BRAVE MINISTERS so they will do the same to these BRAVE Penans whose only fault was asking for donation and making their grievances known to people who gave them empty promises! Once again, its time for our BRAVE MINISTERS to abuse their powers and show the Penans how powerful these ministers are! Here is the Proof that they will do exactly the same to these Penans! The police had abused their authority.